UNHCR assistance is distributed for more than 6,200 individuals in Taizz’s embattled district of Mokha, one of the worst affected areas in the Yemeni governorate. The United Nations refugee agency today confirmed that for only the third time this year, its field teams were able to distribute humanitarian aid in the embattled district of Mokha, in Yemen's Red Sea governorate of Taiz. “The latest UNHCR aid distribution in Mokha will cover more than 6,200 people with emergency assistance, adding to the 69,857 already reached since the start of this year,” William Spindler, spokesperson for the Office of the UN High Commissioner for Refugees (UNHCR), told journalists in Geneva. 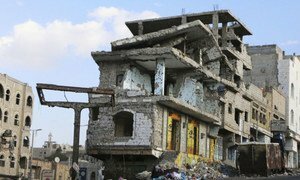 Hostilities in Taiz escalated in January, with nearly 50,000 people displaced, about 27 per cent of the internally displaced people in Yemen. The governorate also hosts about 304,000 additional displaced people. In parallel, north of Taiz, in Al Hudaydah, UNHCR team provided aid for about 17,745 people. Mr. Spindler said that aid workers noted “a huge spike” in needs, with displaced people living on streets, and turning to begging and child labour to survive. “With Hudaydah host to more than 109,000 displaced individuals, many are reporting anxiety about reports of possible intensifications in hostilities in the governorate, unsure of how and where they would flee,” said Mr. Spindler. More than three million who have been uprooted since the start of the conflict two years ago, and more are expected as hostilities are likely to intensify. VIDEO: UNICEF spokesperson Christophe Boulierac warns about increasing cholera cases in Yemen. Meanwhile, the UN Children's Fund (UNICEF) today announced that inferior health systems and water supply provisions are raising concerns for health, particularly for the youngest Yemenis. More than 11,000 cases of diarrhoea have been reported across the country, with more than 250 confirmed cases of cholera. The UN agency and partners are providing diarrhea disease kits, oral rehydration salts and water treatment tables, but the outbreak “is more aggressive” than the last wave in October 2016. At least 130 people have died so far this year. About 7.6 million people in Yemen are living in areas considered high risk for cholera transmission, said UN World Health Organization's (WHO) Christian Lindmeier. Voicing concern over lack of humanitarian access – particularly for medicine and medical supplies – in war-torn Yemen, a senior United Nations relief official has called on all parties to the conflict to ensure urgent and unrestricted access to people in need across the country.